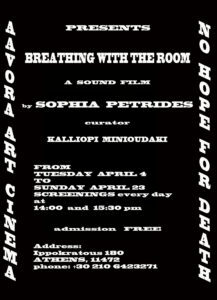 Aavora Αrt Cinema in collaboration with art historian Kalliopi Minioudaki is pleased to present Sophia Petrides: No Hope For Death, a site-relevant and selective exhibition of Sophia Petrides’ multipart sound film Breathing with the Room (2009-work in progress): a mesmerizing, gendered, tender yet discomforting contemplation on the human condition. Breathing with the Room follows the daily trips of a nameless cast of characters through private and public spaces cinematically fleshed out by sound and dramatically animated by sonic conversations between objects, humans, animals and all the above. Anything but a conventional movie, Breathing with the Room is a visual work crafted solely with sound: a richly layered digital collage of found sonic fragments that combines familiar sounds with excerpts of music and vocal recordings. Sonically collapsing the borders of real and imaginary spaces, it uses new means to continue the exploration of the co-extensiveness of space and being that distinguishes Petrides’ sculptural, photographic and installation work, marked by the centrality of the room as a metaphor for the architecture of mind and body. Intensifying Petrides’ visual poetics of spatial intimacy, Breathing with the Room also radically contributes to the call for perceptual engagement attempted by various manifestations of contemporary visual and sound art. No Hope For Death combines three individual works conceived as distinct scenes of Breathing with the Room: The Thought of Mother, 2014; Motorcycle Symphony, 2013; and Breathing with the Room, 2016. The exhibition is titled after a phrase from Samuel Beckett’s novel The Unnamable, a phrase recited in The Thought of Mother. This title articulates the nihilistic bite of the artist’s view of life’s contingency on death, while serving also as a commentary on the artistic and sociopolitical impasses of our time. Comprising back-to-back “screenings” of the aforementioned works against a blank cinema screen, No Hope For Death stages hour-long events of liberating embodied seeing; intense acts of listening, in the sense of Jean-Luc Nancy’s understanding of listening as an active “straining” for the meaning of sound and “a relation in self.” Unsettling the expectations of both cinema-goers and art viewers, the exhibition foregrounds the criticality of Petrides recent withdrawal from the visual image as a means to resist the relentlessness of contemporary screen culture in order to activate the atrophied sensory and emotional access to conscious and subconscious being. Like the work itself, No Hope For Death invites the viewer to co-script Petrides’ sound film through the emotional and visual discoveries that sound can affectively initiate. Conceived as a “sonic journey from the unreality of the seen to the reality of the unseen,” Breathing With the Room orchestrates personal embodied experiences of viewing that counter narrative film’s audiovisual, ideological and emotional subjugation of the viewer, opening the work to the artist’s and each viewer’s subjective aural inhabitation of space. Rather than offering a cinematic escape it challenges viewers with an inescapable return to their own selves, led by the artist’s intimate and brutal sonic dives in the architectural, mental and bodily rooms of human existence. Sophia Petrides is a Greek artist based in New York and Berlin. She holds a Bachelor’s degree in sculpture from Parsons, The New School, New York (1992), as well as a Bachelor’s degree in political sciences from The Panteion University, Athens (1985). She studied literature and photography at Deree College (Athens), and drawing and painting in various private institutions. Petrides’ multidisciplinary practice encompasses drawing, photography, sculpture, sound and video, often combined in large-scale installations. Her work explores the spatial perception of the private and the psychodynamics of the esthetics of architecture and its mistrust, in conjunction with the social and political awareness of the public and its control of the private. The foundations of her practice lie in architecture, literature, philosophy, and the visual arts. Petrides has participated in many solo and group shows in the United States, Europe, Asia, and Africa by Paradigm Art, Larissa Goldston Gallery, Cais Gallery, Hyundai Gallery, Projects United, Smack Mellon, Icebox, Zone D and many others. Her work has been exhibited in various museums, such as The Michigan Museum of Contemporary Art (US), Museum on the Seam (Israel), Daelim Museum (Korea), Averoff Museum (Greece) and is represented in important private and corporate collections as well as public institutions. The public debut of her recent experimentation with sound took place at a group show at the Convent of St Cecilia in New York in 2011 with the synopsis of Breathing with the Room. In Greece The Thought of Mother was first shown at the Stavros Niarchos Foundation Cultural Center in 2015.